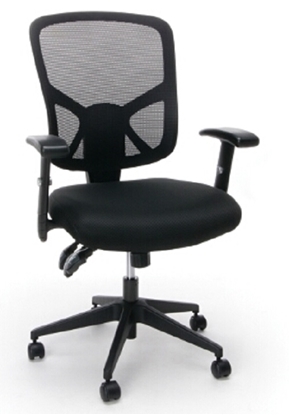 The breathable mesh seat and back conforms to the body for added comfort on this OFM office chair. Adjustable lumbar support insures even more comfort on the lower back. A mesh chair that is great for use in the home or at the office. 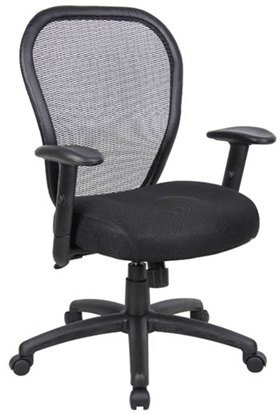 This chair features a thick padded contoured seat, adjustable height armrests, and pneumatic seat height adjustment. A contemporary chair upholstered with mesh material, which allows air to pass through, adding to long term comfort by preventing body heat and moisture to build-up. 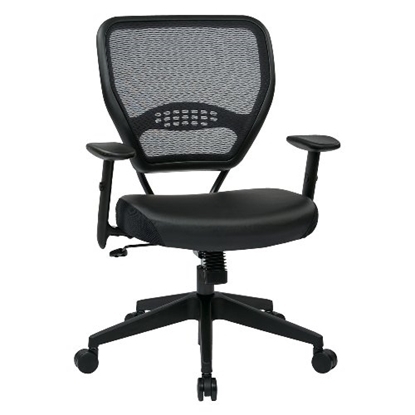 This mesh office chair also features adjustable tilt tension control, pneumatic gas lift, and adjustable height arm rests. This mesh guest chair from Office Star features a thick padded contour seat and Air Grid back with built-in lumbar support. Heavy duty sled base. Perfect for additional seating in your executive office, reception area or conference room. Warranty and free shipping included. 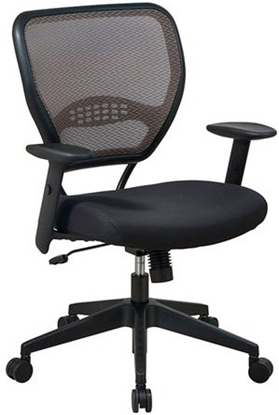 A mesh back office chair that can be used in conference room, private office, or cubical settings. 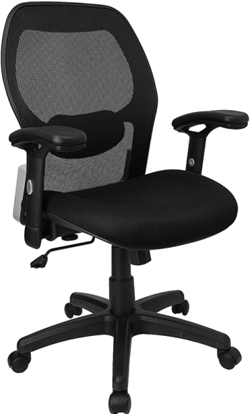 The MS8901 features an adjustable lumbar support, knee-tilt control, and adjustable arms. 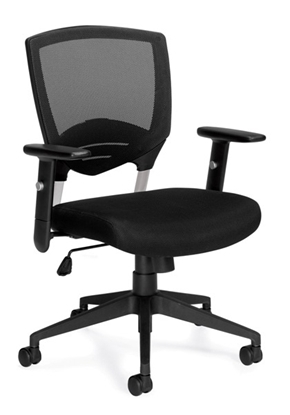 This Greenguard certified task chair from OFM offers many adjustments to provide all day comfort at your desk. 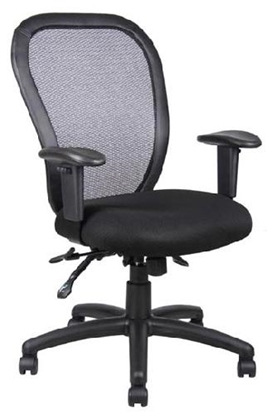 An executive style mesh back office chair at an unbeatable price. 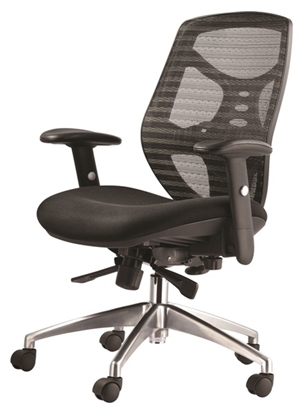 The MS8905 Mesh Chair features a Chrome Base, Pneumatic seat height adjustment, Tilt Tension Control, and an auto adjusting synchro tilt mechanism that uses your weight to balance the force needed to recline back. This Office Star Executive Mesh Chair features breathable Air Grid® back with built-in lumbar support, a cushioned seat and 2-to-1 synchro tilt seat adjustment. 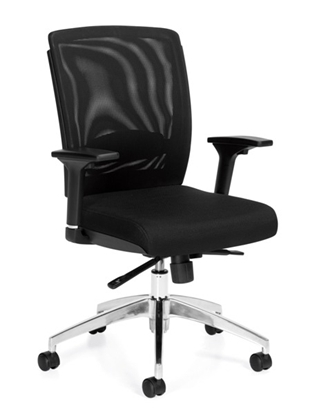 Available in Black Polyurethane, this chair is perfect for an executive or home office space. Free shipping and warranty available. The Office Star 5700E deluxe mesh and eco-leather office chair features a thick padded contour seat and Air Grid back with built-in lumbar support. The eco-leather upholstered seat gives it an executive look. Perfect for a home office or executive desk. Warranty and free shipping included. 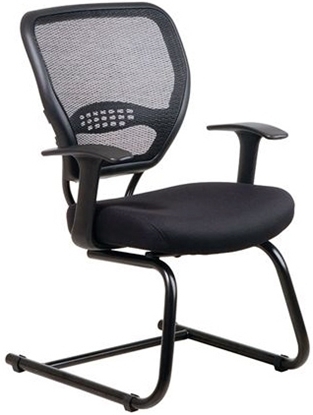 A mesh back chair that can be used at home or at the office. This mesh chair features a 3 paddle multi-function tilting mechanism, padded back frame, and seat tilt lock. 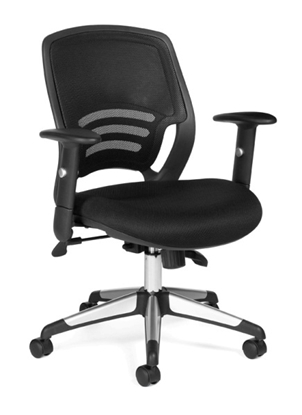 The combination of a mesh back and a thick padded seat make this office chair a great choice. The W42B from Flash Furniture features a durable thick contoured fabric seat, mesh back with lumbar support and pneumatic seat height adjustment. Perfect for a home office or executive desk. 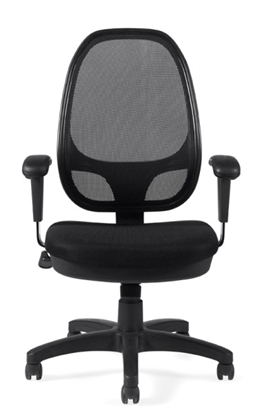 A stylish mesh back chair that features a soft, breathable fabric seat and height adjustable arms. Includes twin carpet caster wheels for portability. 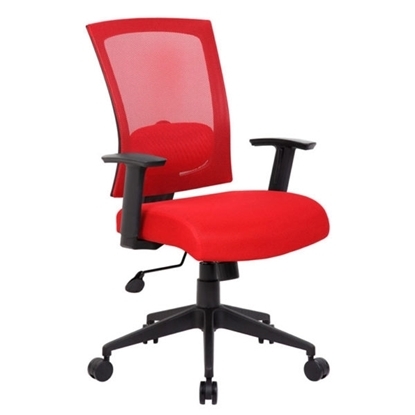 This model can be used as an everyday home office chair or with an executive desk. A multipurpose chair that can be used in conference rooms, private offices, home offices, and collaborative work areas. 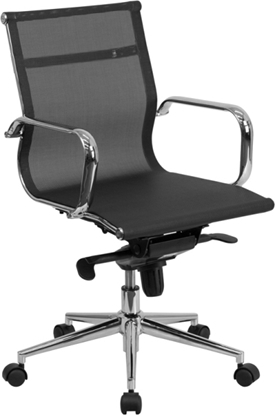 This mesh chair features tilt tension adjustment, pneumatic seat height adjustment, and a polished aluminum base. 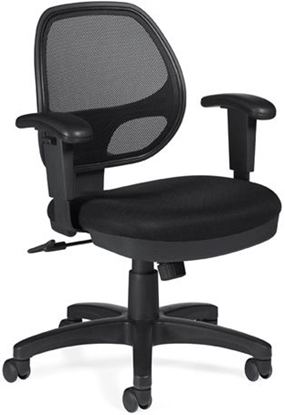 A fully adjustable mesh office chair at a great price, the OTG11686 gives good support. This managers chair features attractive chrome accented base, soft mesh back with breathable fabric seat, and height adjustable arms with polyurethane arm rests. Perfect for an executive office or home workstation. 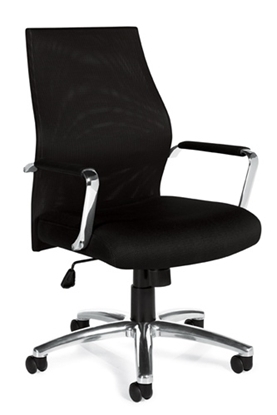 An attractive mesh back office chair with highly polished chrome arms and padded arm rests. The breathable mesh back allows you to stay cool throughout the day. A great choice for an executive workspace or in a home office. A great chair for your conference room, office, or home office. 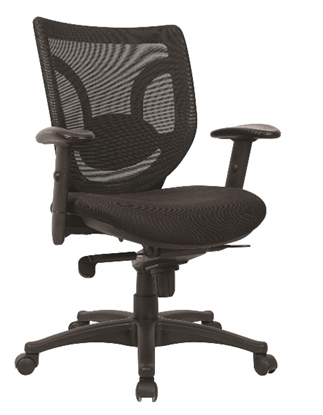 This mesh chair features a built in lumbar support, molded seat and back, and 2-to-1 synchro tilt adjustment. Order today and get free shipping! A mesh chair with some added style, this office chair features titanium accented dual back uprights, height adjustable arms with titanium accents, and pneumatic seat height adjustment. This chair works in almost any home or office setting.